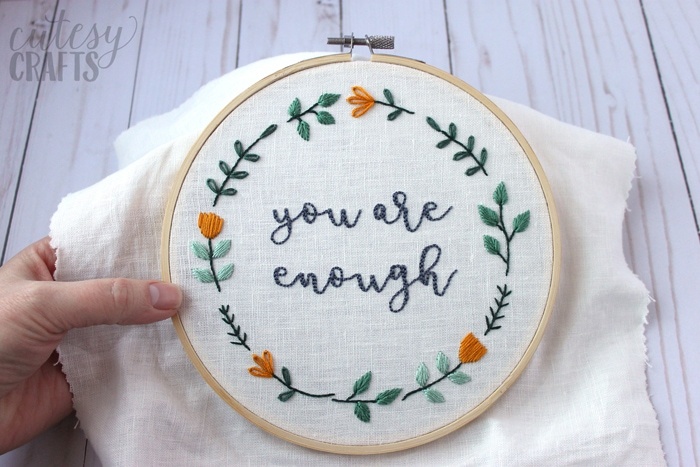 I like to look around for inspirational quotes to embroider, and this one caught my eye. 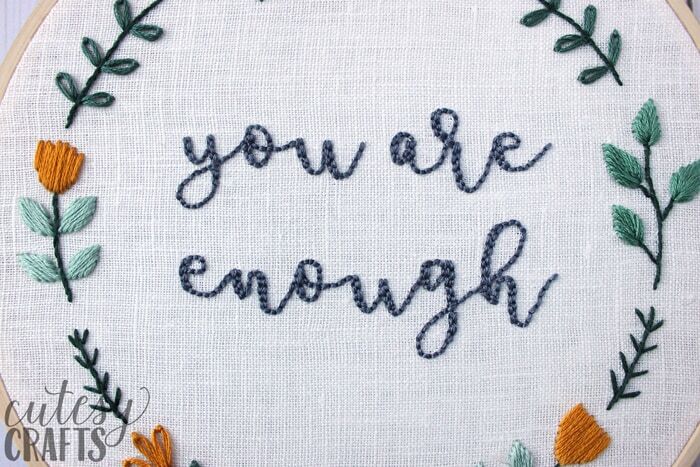 I love the message of “you are enough.” It helps me remember that I am exactly who I am supposed to be. I’m enough as a mother, as a wife, as a person because I’m here every day, doing the best I can. 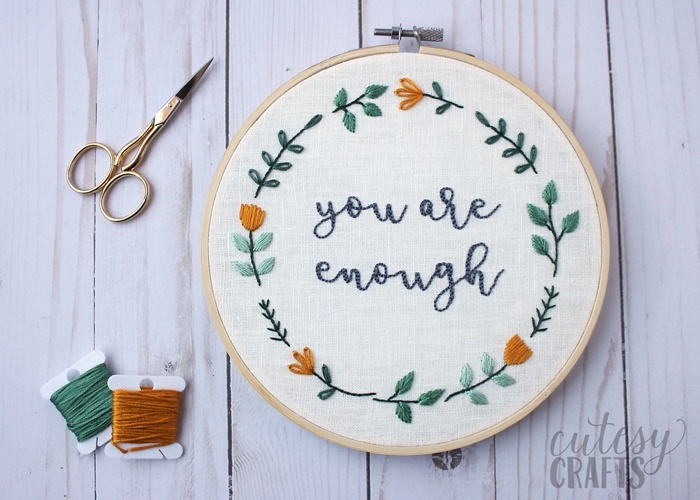 I decided to turn it into an embroidered quote, and I’m sharing the free pattern with you. If you are new to embroidery, make sure to take a look at my How to Embroider for Beginners page. I just love how this hoop turned out. At first, I wasn’t sure about the color scheme I had chosen, but I think mustard yellow is going to be a new favorite. It looks so pretty with all of the different greens. I labeled the small leaves as a satin stitch, but they are somewhere between a satin stitch and a fishbone stitch. I wasn’t really sure what to call them. You start out just like you are doing a fishbone stitch, but the first stitch from the top is really long. It should come down almost to the base of the leaf. You come in from each side, like a fishbone stitch, but you bring the needle down in the same hole a few times at the base. I have a video here on my YouTube channel that you can watch to help. 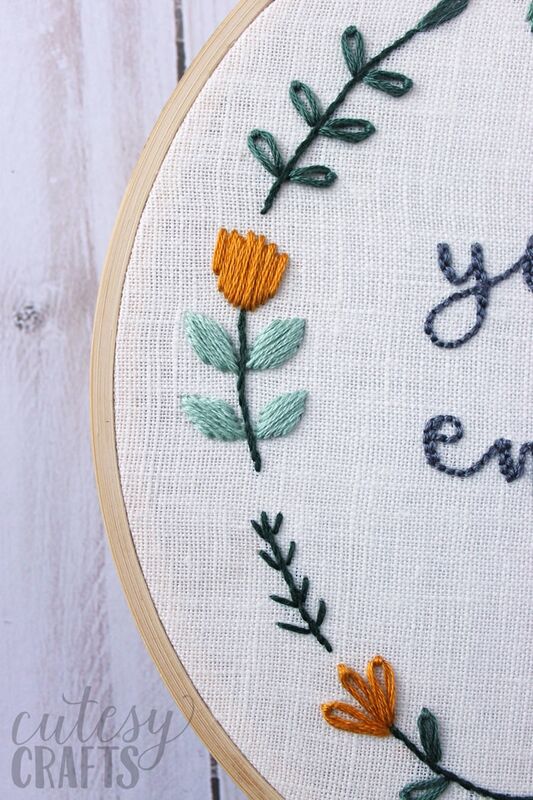 The yellow flowers are also a satin stitch, but I varied the length of each stitch to give the flowers more texture. The words are a back stitch. For the thicker parts of the font, I did two rows of back stitch next to each other. Take your time on this and use short stitches around the tight curves. Head over to my post on how to embroider letters by hand for a video tutorial. 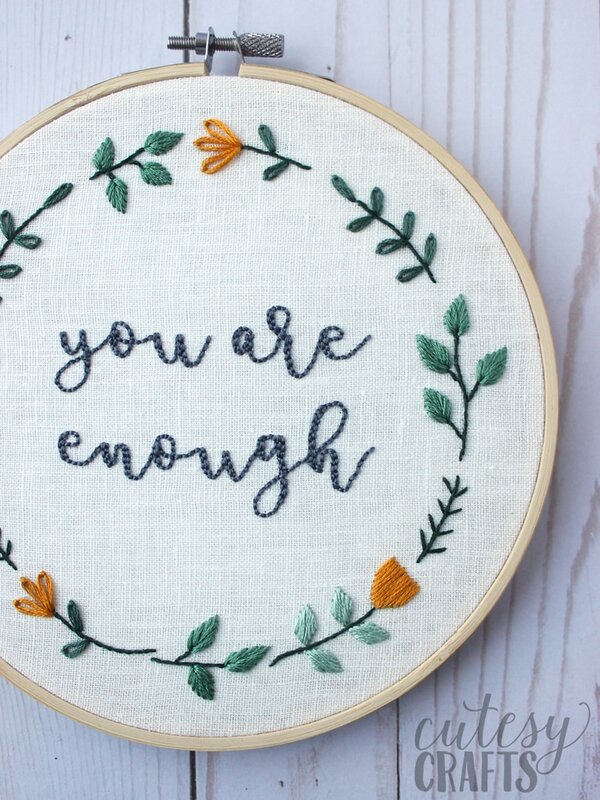 As you are stitching, I hope this embroidered quote inspires you to remember that you really are enough just by being yourself. Make sure you check out all of my hand embroidery designs. 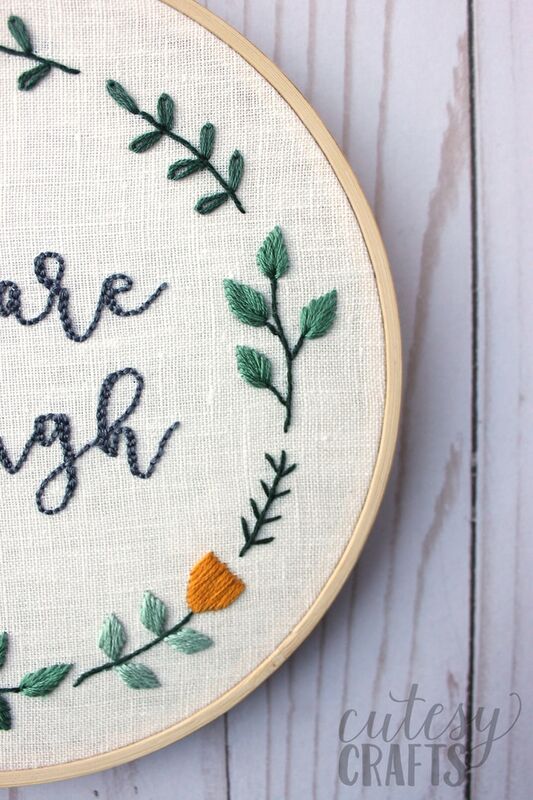 I have over 20 free embroidery patterns for you to try out! I’m a subscriber but don’t know how to get your free pattern. When I put my name and email, it is to subscribe. Where do I enter my info to get free download pattern? When you subscribe, you’ll get an email with a link to confirm. 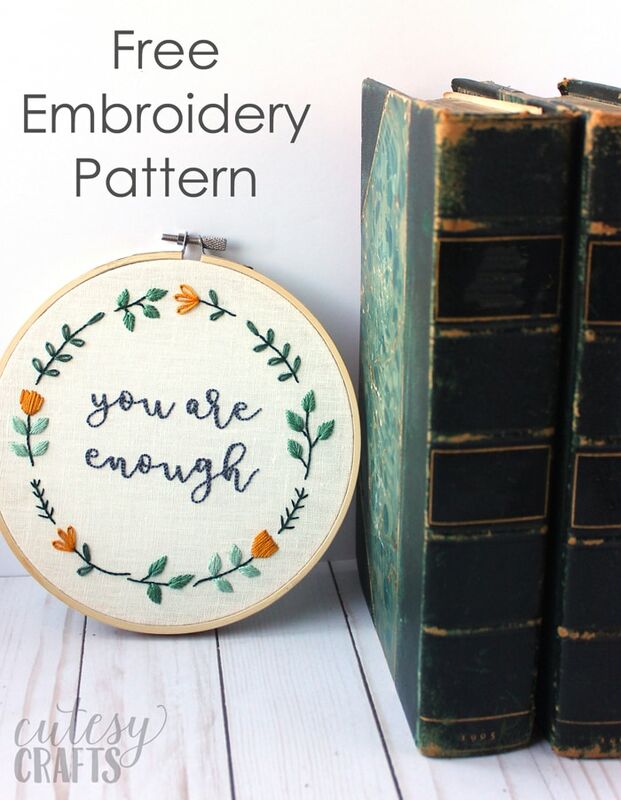 Once you click that link, another email will be sent to you with the link to my embroidery pattern library. If you have any trouble with it, let me know and I can help. Did you subscribe to my emails? Once you do that, you’ll get a special link that will take you to all of my free patterns.